As failure analysis engineers for companies, our job is to find the root cause of failure and recommend changes in design, process, tests, etc. to fix the problem. This type of analysis has become an important part of semiconductor mass production, which makes electronics cheaper and affordable for consumers. At the same time, mass production helps the manufacturer / producer of parts by increasing their profits. What we need to recognize is that both producers and consumers are vital for the semiconductor industry. Without a healthy demand for the latest electronic gadgets such as smartphones, tablet PCs, hybrid cars, etc. there would be no incentive for global semiconductor firms to keep investing in the research and development of new technologies that improve the quality of life. While we make a living through the failure analysis of modern-day electronics and keep our jobs, pay for mortgages, groceries, utilities, cars, etc., we also contribute to the demand for other goods by spending our wages. We are workers on one side and consumers on the other. Consumer spending helps create jobs for other services and 70% of the US economy depends on consumer spending . 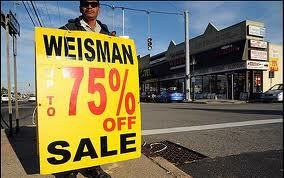 It is the consumer’s purchasing capacity that is the best metric of economic performance. Producers and Consumers are like two wings of a bird. If either of the wings gets hurt, the bird will no longer be able to fly. If that bird is not nursed quickly and properly, it would be disabled and either die from hunger or fall prey to a predator. With the same analogy, both producers and consumers have to prosper for a robust economy. Before we get into more details of macro-economics, let us see where the economic profession stands at this juncture. In a recent article in The New York Times, Professor Robert J. Shiller of Yale University and a best-selling author argues that even now we don’t understand what really causes a recession and layoffs . But another best-selling economist, Professor Ravi Batra, seems to have solved the puzzle of recessions by offering a new theory of unemployment. His theory relies on common sense as he argues that recessions and depressions occur when worker productivity keeps rising faster than the economy’s average real wage. He demonstrates that this happened in the 1920s, which were followed by a depression. The same thing also occurred during the 2000s and the world has been in The Great Recession since 2007. Batra argues that worker productivity is the main source of supply while wages are the main source of demand. If productivity rises faster than wages, then supply rises faster than demand. This results in overproduction and forces the manufacturer to fire workers. Producers are the suppliers of goods, and consumers generate the demand for these goods. Consumer demand, being dependent on wages, is sustainable only if the consumers as workers earn higher salaries. If the wages of consumers do not catch up with increased supply of goods, the supplier of goods is unable to sell all that he/she has manufactured. Let us take an example of the semiconductor industry where the semiconductor wafer foundries manufacture tens of thousands of wafers per month. These facilities supply silicon for the semiconductor industry. For a wafer fabrication facility to be profitable, it has to be able to produce as many wafers as possible that meet the Statistical Process Control (SPC) stability metrics and customers’ quality requirements when it comes to DPPM (Defective Parts per Million). This ability to mass produce is measured by the productivity of the work force. A wafer foundry, like every other company, wants its employees to be highly productive to maintain a high supply of wafers for its customers. The wafer fab management pays incentives based on productivity. Now, where does the need come for wafer fab to hire more workers? This occurs only if wafer fab customers demand more goods. Where does the customer demand come from? It comes from the wages of the people. When we have an economy where employed people have high wages or high purchasing capacity, they are able to generate a high demand for goods. Hence, the wages of the workers have to catch up with their productivity. If employees are very productive, that is they work hard and efficiently, they are able to increase the supply of goods into economy with their productivity. Now, what happens if the wages of the productive workers fail to catch up with their productivity? As a result of the growing gap between wages and productivity, eventually the purchasing capacity of the workers is not able to catch up with the amount of goods that are being manufactured by them. Hence this correlates to a gap between the supply of goods and the sustainable demand for them. In other words, the wage-productivity gap causes a supply-demand gap. In my previous analogy, this hurts one of the two wings of a bird. In other words, the imbalance between oversupply of goods and weak demand for them leads to layoffs at the wafer fabrication facility. This is how an economy is so closely connected to maintaining a sustainable supply and demand of goods. Thus layoffs occur when people’s purchasing capacity falls short of the goods that workers produce due to their high productivity. Some brilliant minds have devised a way to keep the wages of workers to remain the same or even fall, i.e. not letting wages catch up with their high productivity, but still maintain a high consumer demand. They do this by creating ‘consumer debt’. When a consumer is unable to buy much out of their real salary or wage, he/she can buy it using a credit card or by going into debt with a loan from financial institutions. While relatively stable consumer debt is good for the economy as long as the borrower is able to repay his/her debt within the allotted time frame with interest, what can consumers do when they lose their jobs in a recession, and are not able to find other employment soon? If the consumer is not able to repay his/her debt in time, the increase in interest on the credit card loan wipes out his/her savings, thereby resulting in bankruptcy. It should be clear that when wages trail productivity, the overall economy suffers because of the reduced purchasing capacity of unemployed workers. If you follow this logic, then it is evident that consumer’s purchasing capacity is critical for sustainable demand. Hence, I consider a strong consumer purchasing capacity to be the chief source of high consumer demand, which acts as an engine for economic growth. Thus, the real job creators in a free market economy are not only the producers of goods but also the consumers of goods. Every company estimates its consumer base prior to manufacturing in order to avoid the over-production of goods. Hence, if consumer demand keeps on weakening, then the economy goes into a recession. In that case to avoid a depression, the government has to step in and increase its own spending that makes up for the loss in demand due to lost wages of the laid off workers. The government may also cut tax rates to boost consumer demand. In either case, the budget deficit rises, and may rise very sharply if the wage-productivity gap and hence the supply-demand gap are very high. This is the main reason why the budget deficit rocketed after 2007, so much so that it almost tripled from about $500 billion in 2007 to $1.3 trillion in 2011. Now, if government spending creates jobs, then these workers can jump start the engine of economic growth by paying off their debts and boosting consumer demand through their real wages. The higher the wages of these workers, the higher will be their purchasing capacity and the higher the consumer demand. This would act as an incentive to the producers/manufacturers to make further investments. However, if increased government spending does not boost consumer demand and instead goes into the pockets of manufacturers, the manufacturing sector may hire a few more workers because of the extra money it receives from the government stimulus, but that growth will not be sustainable. In fact, a case can be made that the high budget deficit of recent years has mainly helped the manufacturer. For instance, in 2011 the economy generated 1 million new jobs with the help of a budget deficit of $1.3 trillion. If you divide 1.3 trillion with 1 million, you get 1.3 million. In other words, the government spent an extra $1.3 million to create one job in the economy. Is this not absurd, given the fact that the average wage is only $50,000 per year? Thus, the government deficit is now mainly helping the manufacturers, who must be getting the difference between $1.3 million and $50,000 for each person they hire. As Batra shows, this is what the continued rise in the wage-productivity gap does to an economy. Just 15 years ago, in 1999, we had a budget surplus along with an unemployment rate of less than 5 percent. Today, we have a trillion dollar deficit along with an unemployment rate close to 8 percent. An economy is sustainable when it is able to balance its trade and budget. If any country has a trade deficit (where imports are larger than exports), it leads to a fall in the country’s FOREX (FOREign eXchange) reserves (which eventually depreciates its currency). The value of a country’s currency is a deciding factor in the standard of living. Hence, a country cannot run year-over-year trade deficits if it wishes to maintain the standard of living of its citizens. Also, high trade deficits result in loss of FOREX reserves, which are important as they determine the buying power of the country’s currency. Let us take an example of a country ‘A’ where its population has sufficient purchasing power and can buy everything produced in the nation. But there are some products that are not produced at home and have to be imported from another country ‘B’. Hence country ‘A’ has to pay money [its currency] to buy country B’s goods. Either country ‘A’ has to balance its trade by getting country ‘B’ currency from a third country ‘C’, or go on printing its own currency. But there is a limit that country ‘B’ will accept country ‘A”s money. After that country ‘A’ will have to produce the items within the country, causing huge inflation due to depreciated value of its currency resulting from excess money printing. It is possible to avoid trade deficits through balanced trade policies. Fair trade is more important than Free trade. Free trade implies no import duties imposed by a country on its imported goods. While Free trade works great when trading with countries having nearly similar value of their monetary currencies, it results in high trade deficits when multinational corporations (MNCs) from a rich country make goods for cheap in another country with a significantly lower value of its currency. The MNCs in the United States prefer to manufacture things in low wage countries with cheap currencies, as it is highly profitable. However, in addition to increasing trade deficits, this practice also leads to massive job losses in the home country, especially when jobs are also outsourced. As a result of this free trade policy, the U.S. economy has been running over half a trillion dollar trade deficit for the past four years .While such a deficit results in higher corporate profits for MNCs in the United States, it results in depreciating FOREX reserves. This threatens the economic independence of the U.S. as a country. 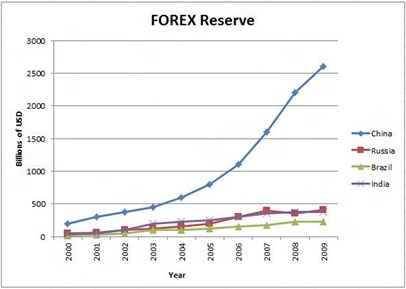 Figure 1 below shows the FOREX reserves of BRIC (Brazil, Russia, India and China) in USD over ten years. According to Dr. Richard Haas, Chairman of the Council of Foreign Relations, China’s ownership of trillions in FOREX is a great threat to the United States, as China, with vast FOREX reserves, is in a position to influence US foreign policies through its control over the value of US currency .This is similar to the way the United States was able to dominate the foreign policies of Britain and France after World War II and forced their troop withdrawal during the Suez crisis purely because of its ownership of British and French debt. During the Reagan years, the trade deficit started to increase at a rate not seen in the last 60-70 years . The Reagan administration then had to pressure Japan to sign the 1985 Plaza Accord to devalue the U.S. dollar at the expense of the Japanese yen in order to increase U.S. exports. As a result of yen’s appreciation, Japan experienced an economic crash and lost a decade of growth. The Nikkei average went up to about 39,000 in December 1989, but after the crash it hovered around 15,000 during the lost decade of the 1990s. In the last several years it has dropped even more, hovering around 10,000 . Looking at the fate of what happened to Japan as a result of the yen appreciation; China has refused to appreciate its currency significantly in spite of the pressure by the Obama administration, which hopes to boost U.S. exports to China . This should be a great concern for the United States because it would not be able to export significant amount of goods to China to balance its trade. In addition to nearly 600 billion dollars in trade deficit due to free trade policies, the counterfeit electronics from China entering into the U.S. supply chain have become a national security threat . Initially, the United States manufactured all defense-related products at home. However, consumer electronics were being built in China due to its low cost of labor. As technology progressed to advanced transistor technology, it required a large investment from defense contractors, who work for profit, to manufacture semiconductor wafers in the United States. Hence, several defense contractors started to use Chinese built ICs for military weapons like missiles and machine guns. Along with the state-of-the-art infrastructure, the technical know-how to make advanced technology products has also been transferred to China. So now China is flooding the U.S. defense supply chain with counterfeit ICs . It has become very costly to prevent this, which is also eating away profits of U.S. defense contractors. The free trade policies of the United States are creating a perfect storm for its semiconductor industry. According to Professor Ravi Batra, “Free trade has done to the United States what Hitler and Imperial Japan could not do during the war.” He characterizes free trade as the ‘Agrification syndrome’ by which Americans continue to lose manufacturing jobs, and continue to work harder at the jobs they do have, but suffer declining wages, despite increases to their productivity. If the United States had adopted fair trade instead of free trade, it would have imposed tariffs on the cheap goods that are dumped in this country by China. As people prefer to get the best value for their money, U.S. consumers would have preferred to buy U.S. made goods as tariffs would make them competitive with Chinese goods. This way manufacturing jobs would have been preserved. Simple math shows that by just eliminating the 600 billion dollar annual trade deficit would create 6 million jobs paying a $100,000 salary every year. This is a simple job creation strategy, as the country faces the highest unemployment rate since the Great Depression. If you observe Fig. 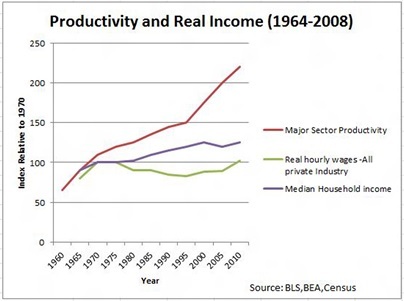 2 above, real wages have failed to keep up with productivity since the 1970s. The productivity of American workers has been consistently increasing. However, the average household median income has not increased at the rate at which productivity has increased. The real hourly wages have remained fairly constant. The United States needs to reform its current economic model so that wages keep track with the productivity of workers . Professor Batra argues that this can happen only in a free market system, where companies are small and unable to control prices. In such a system, there would be no need for the government budget deficit, and it would raise the living standard for every individual in society. Under this system, the majority of shares of corporations would be owned by its employees rather than by a few investors on Wall Street. When workers become majority shareholders, they know that they are part owners of the company and will be fairly rewarded for hard work. By being highly productive, these workers would receive a fair share of corporate profits. The system would still preserve the incentive for growth because hard work would bring higher incomes. At the same time, it would avoid severe recessions and depressions caused by poor consumer demand (due to a huge gap between wages and productivity resulting in poor purchasing capacity of the majority of consumers). Also, in economic downturns, it will be possible to cut back the working hours of the workers and reduce their wages across the board rather than lay off some workers. This would minimize, if not eliminate, the problem of high unemployment . Modern economic thinkers blame automation as a major cause of job losses. Technology could be productively utilized in such a way that the manufacturing sector could cut back on work hours while paying workers a high wage due to their high productivity. This is because automation enables a worker to be very productive through use of machines to manufacture products. High worker productivity significantly increases the supply of goods in an economy. As a result workers would be able to work for fewer hours to achieve their production target. They could use their spare time to pursue higher education, leisure, hobbies, vocational training, etc. This way it is also possible to minimize, if not eliminate, the problem of high unemployment resulting from automation while still keeping the supply of goods proportionate to consumer demand. Employee guided firms will also be able provide health insurance and pension benefits to workers and the government would not need to spend money for this purpose. This way the budget deficit would fall to zero and the national debt could be retired over time. Additionally, it would also avoid undue pressure from Wall Street to ship jobs overseas under pressure of delivering maximum profits to Wall Street investors. This would minimize speculation, malpractices and economic bubbles through economic self-regulation with minimal government interference. 15. Ravi Batra : The New Golden Age : The Coming Revolution against Political Corruption and Economic Chaos, New York, Palgrave Macmillan, 2007. Also see ravibatra.com for Batra’s other writings. 16. P.R.Sarkar : PROUT in a Nutshell, AMPS. Apek Mulay is a Sr. Failure Analyst at Microtech Analytical Laboratories in Plano, TX. His studies started at University of Mumbai, India where he pursued his undergraduate studies in Electronics Engineering. He completed his graduate studies with M.S. thesis from Texas Tech University, Lubbock, TX. After graduating he has worked as Failure Analysis engineer in US corporations like Qualcomm Inc. and Texas Instruments Inc. Prior to joining Microtech, Apek was working on 28nm technology development in Advanced CMOS technology development team at Texas Instruments Inc. Apek is also an author of one Patent while employed at Texas Instruments Inc. He has been actively involved in ISTFA by chairing technical sessions at symposium. your Analysis is highly laudable and Im glad you base your analysis in conformity with Prout principle of economic justification. it is intersting analysis it has information which could be unferstood by those who might not have economicd as subject of study. It gives a new dimension and opens up altogether a novel idea. Your model only works if you limit mobility of workers between firms. When a worker is required to accept a 50% pay cut and stay there regardless, the inefficient (and unproductive) firms do not fail and you end up with an ecomony that resembles one of ‘centeralized control’. Moreover, if the goal of automation is to increase ‘leisure’, what incentive does a corporation have to invest in automation? A competing firm that invests in automation and reduces manpower will attract the capital and take the business and the firm paying ‘leisure’ goes away. The entire basis of this system requires restrictions on flow of capital and people–much like centralized economies–who have tried for decades to avoid world economic cycles with no success. Your model only works if you limit mobility of workers between firms. When a worker is required to accept a 50% pay cut and stay there regardless, the inefficient (and unproductive) firms do not fail and you end up with an ecomony that resembles one of ‘centeralized control’. You are wrong on that…Employee owened businesses would never fail as the paycuts will be across the board…hence pay cuts up to 50% will not happen. In fact, This model will boost purchasing power of people in economy…and there would never be need to have as high as 50% pay cut. Besides, The model advocated decentralized supply chains which results in wholesome decentralization of economy rather than centralized economy. Moreover, if the goal of automation is to increase ‘leisure’, what incentive does a corporation have to invest in automation? A competing firm that invests in automation and reduces manpower will attract the capital and take the business and the firm paying ‘leisure’ goes away. You are agin wrong…there will always be incentive to reduce costs with automation but to maintain balance of supply and demand in economy…the working hours of workers would be reduced…since employee owned businesses frst look after employees rather than outside investors…the reduced wok hours and resulting savings from automation will be given to workers..hence workers would get higher salary through automation by working lower hours. That itslef would be incentive for company and economy….to raise purchasing power of workers and ensure that their working hours are minimal. The entire basis of this system requires restrictions on flow of capital and people–much like centralized economies–who have tried for decades to avoid world economic cycles with no success. You are again wrong…the system advocates fair and balanced trade…so there would be restrictions on goods which hurt domestic economy by laying off domestic workers…hence it results in balanced economic growth. Also, It addresses the problems of domestic economy while keeping a check on national economic disasters through trade and budget deficits. I have suggested reforms in system based on a concept of economic democracy which was put forth by Mr.P.R.Sarkar from India. US has moved away from Free market Capitalism in 1950-60 to a kind of crony capitalism which needs to be reformed with progressive ideas that benefits not just producers but also consumers so that supply and demand catch up with one another. (1) The suggested economic system is three-tiered: The cooperative sector occupies the middle industrial tier; local governments run key industries, industries that are huge, complex, or focused on the extraction of raw materials; and small, private enterprises conduct business too small in scope for the other sectors to run and where entrepreneurship is to be encouraged. The latter, as well as cooperatives in their true sense of being directly worker-owned and run where employees are majority shareholders of those firms. (2) This approach to cooperative enterprise is based on voluntary, not forced, cooperation. Under Communism,Soviet farmers were forced to join agricultural collectives, which was extremely un-psychological, and not paid according to their individual output, which was non-productive. Under Capitalism,the focus is to minimize the costs of production in order to maximize their profit. In the United States, for example, they now use millions of illegal immigrants, who are paid only a fraction of the wages of legal workers, in agriculture and other labor-intensive industries. They are trying to legalize these immigrants as well through a comprehensive immigration reform. Once immigrants are legalized and their families move up the economic ladder in one or two decades, millions of new illegal immigrants will be found to work at low wages. If allowed to continue, it will be a never-ending saga. The system of e-verify cannot be enforced when illegal immigrant is willing to work for fraction of pay in cash and there is no record of transaction. It also benefits the employer when he is able to employ somebody for fraction of the salary…this is one of the reasons gap between wages and productivity is increasing. (3) This economic model is based on complete and wholesome decentralization and local self-reliance instead of following Communism’s centralized industrial approach or an approach to maximize profits by moving manufacturing to low wage countries causing massive job losses at home. (4) In such a model, economic governance is bottom-up: Local people have all the say regarding the development and utilization of local resources, etc. The economy would decentralize the planning authority to the level at which people are most aware of economic problems and potentialities, and therefore best able to plan for their common welfare. (5) This approach to an enterprise system is based on worker participation in decision-making and ownership of assets, conditions that increase motivation and enhance possibilities for personal fulfillment. (6)Such an economic model is consumption-oriented. It aims at increasing consumer purchasing power and the availability of consumer goods as the primary means of meeting people’s basic and amenity needs and maintaining economic vitality. (7)In an economic structure based on cooperation between producers and consumers, where industry stands for consumption , the question of unemployment will not arise. Automation and other advances in technology will not reduce the number of laborers; rather, working hours will be reduced and the remaining hours used in non-work pursuits. A reduction in working hours depends not only on productivity, but on the demand for commodities and the availability of labor. (8)Those who want to promote public welfare without antagonizing the owners of capital will have to oppose mechanization. This is because when the productive capacity of machinery is doubled, the human labor required is decreased by half, such that large numbers of workers are retrenched from their factories. A few optimists may say, “Under circumstantial pressure other ways will be found to employ these surplus laborers in different jobs, and the very effort to find these alternatives will accelerate scientific advancement, so the ultimate result of mechanization under capitalism is, in fact, good.” This view, though not useless, has little practical value, because it is impossible to arrange new jobs for retrenched workers as quickly as they become surplus laborers in consequence of rapid mechanization. Today all job creation is happening by Fed giving stimulus for more than 4 years and it cannot continue Stimulus forever. As soon as stimulus halts, the job creation would stop and recession begins. Hence, It is important to bring in new progressive ideas that would bring US back to prosperity. If US successfully implements such a model, world will follow US. If US does not reform its economy and continues on its current path, I have explained in my article the dangers to the sovereignity of US due to weak economy. It is to be noted that USSR has one of the biggest armies in world and collapse of Soviet economy in 1990 left the entire army demoralized. I do not wish that happens to US as I want US to lead the world. Nice article… But still the thing is recession comes after gap of few years… I Believe US Companies mostly engaged in war weapons, (Steel Industry, I.T. Industry, Some extent Service Industry, Supports war weapons industry) AND Weapons are not the things can be purchased every now and then. What to do to sell this weapons ? big question for Industry… and then Starts….. Thank you for your comments on my article. It is true that World wars have led to tremendous development of new and advanced technologies. However, I do not support the fact the all US companies are engaged in war weapons. The deaths caused by domestic gun ownership in US today surpasses the number of men and women who have dies over years in all wars fought by US. A balanced economy means an economy that primarily focuses in improving standard of living for all. Technological investments in Infrastructure, Agriculture, Public transport, mining, etc. create jobs and gives returns by benefitting the overall economy which involves the owners of capital and utilizers of services. Why not investment in these constructive projects rather than destructive ones. While it is very true that a strong military is important for protection of sovereignty of any country, without a strong domestic economy even strong army is of no use. What will a country d with all its weaponry when it cannot fuel its tanks, war planes, battleships, etc. due to its weak currency? This exactly what happened to Soviet Union and their tanks were left rusting in junkyards after the economic collapse of USSR in 1990. So, Increasing domestic consumer purchasing capacity benefits one and all. This is the recipe of sustainable growth avoiding recessions and depressions.